Our activity, our services for individuals, groups and companies, our advantages and our contact informations. Legal disclaimer, about personal informations we collect, copyright and credits. Our general terms and conditions for hot-air ballooning. Description about the feelings during a hot-air balloon flight. Description about each steps of a ballooning adventure. Description of the DISCOVERY balloon ride offer. Descripcion of the PRIVATE / VIP ballooning ride offer. Descripcion of the FAMILY ballooning flight offer. Descripcion of the GROUPS & COMPANIES ballooning activity offer. Descripcion of the PYRENEES balloon flight offer. 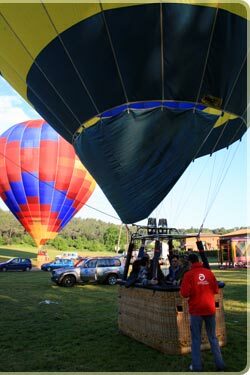 Descripcion of the PYRENEES CROSSING balloon flight offer. Booking form for a hot air balloon ride reservation. Informations about possibilities in advertising with balloons and inflatables. Advertising with hot air balloons, with banners, a hot air balloon contruction with your brand on it, sponsoring and promotional events. Advertising with cold air inflatables, also with helium inflatables, for any fairs, meetings, expositions, indoor and outdoor communication, etc. The basket, the burner, the enveloppet, how does a balloon fly, how to control it, etc. Brief history from 1783 at nowadays. The world round trip in a balloon, altitude record, etc. Frequently asked questions from the passengers. Tourism in Catalonia, Bracelona, Associations, competitions, weather forecasts, etc. Descripción de un globo aerostático, vuelos en globo, bautismo del aire en globo, varias fórmulas de vuelo en globo en Catalunya, Publicidad en globo aerostático, formas hinchables publicitarias, records, aventuras, etc.